Princess Margaret of Connaught had a number of tiaras at her disposal during her tenure as crown princess of Sweden, but none of the others are quite as romantic and sentimental as today's piece: the Cartier tiara given to her as a wedding gift by the Khedive of Egypt. The Khedive tiara's story begins even before the piece's creation. 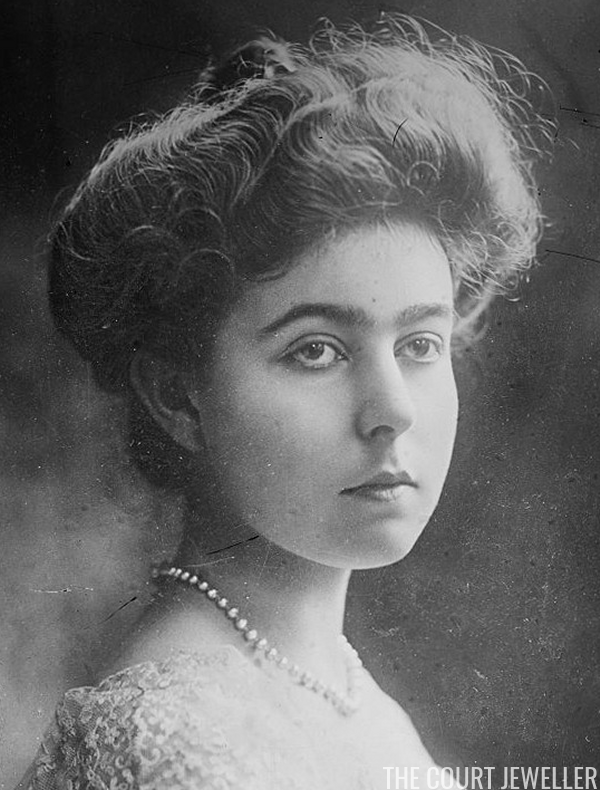 Princess Margaret, the niece of King Edward VII of the United Kingdom, was on a royal tour with her parents, who wanted to marry their daughters off to suitable royal spouses. They had their eye on the future king of Sweden, Gustaf VI Adolf, as a prospective partner for Margaret's sister, Princess Patricia. They rendezvous-ed with Gustaf Adolf in Cairo, where he immediately fell in love -- but with the wrong sister. It didn't matter, in the end; Margaret was in love with him, too. Gustaf Adolf proposed to her during a dinner at the British consulate in Cairo, and the two were married at Windsor in 1905. Because their love story was so tied to Cairo, it was important that the Khedive of Egypt -- the governor of the country, which was ruled by the British at the time -- give them a suitable wedding present. 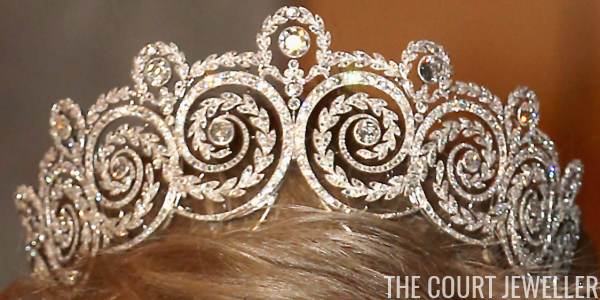 He commissioned Cartier to make this tiara for the occasion. The piece, which has alternately been described as a scroll tiara and as a tiara featuring marguerite motifs, bears considerable similarity to another piece made for the Egyptians at roughly the same time: Princess Shwikar's tiara. That piece has never been firmly attributed to Cartier, but I wouldn't be surprised at all if the same jeweler was behind both sparklers. Margaret wore the piece during her time as Sweden's crown princess, both as a tiara and as a dress ornament. 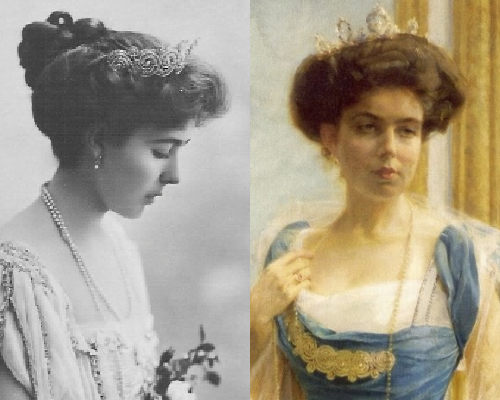 You can see her wearing the Khedive on the bodice of her dress in the Axel Jungstedt portrait shown at right above (she's also wearing the Connaught Diamond Tiara in the image). The way that Margaret has positioned the piece in the portrait fits with its depiction in the illustrated guide to her wedding gifts above. In the illustration, the piece is pictured in bodice-ornament form. When worn as a tiara, it's flipped so that the scroll elements are at the base. Unfortunately, Margaret had little time to experiment with her tiara collection. When she died in 1920, this tiara was one of the jewels that was inherited by her only daughter, Princess Ingrid. She brought the tiara with her to Denmark when she married Crown Prince Frederik (later Frederik IX) in 1935. 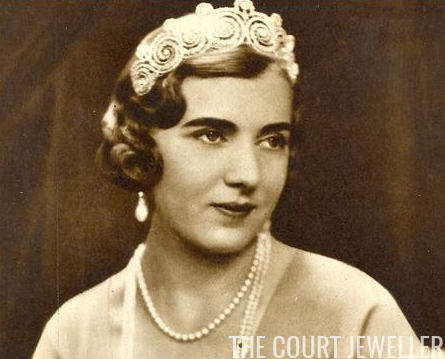 Ingrid didn't wear this piece on her wedding day, but it was through her influence that it has become the official wedding tiara for all of her female descendants in the years since. So far, the bridal wearers of the Khedive have been Queen Margrethe II of Denmark; Princess Benedikte; Benedikte's two daughters, Alexandra and Nathalie of Sayn-Wittgenstein-Berleburg; Queen Anne-Marie; and her elder daughter, Princess Alexia. 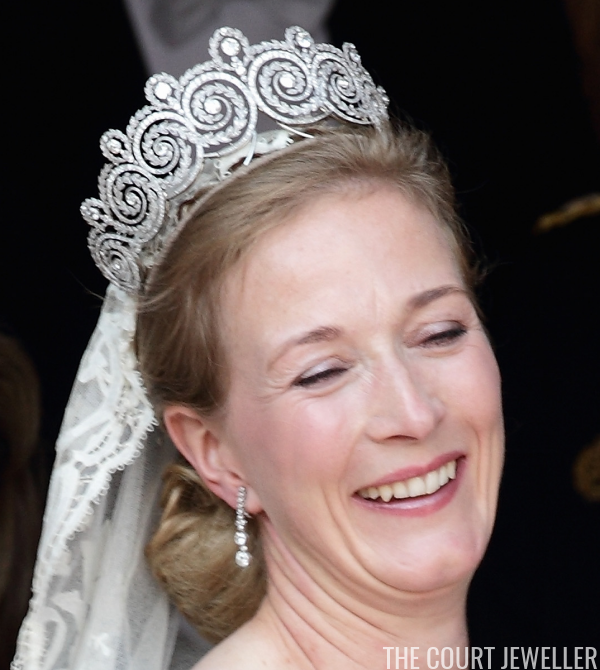 Anne-Marie's younger daughter, Theodora, will also be eligible to wear the tiara if she decides to marry. 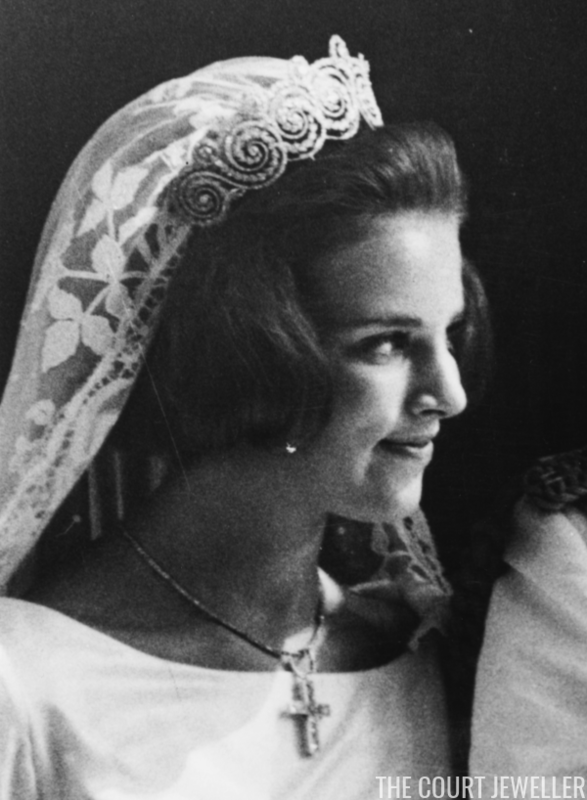 After Ingrid's death in 2000, she left the tiara to her younger daughter, Anne-Marie, the former queen of Greece. Anne-Marie has had alterations made to the base of the piece, so that it sits much higher now on the wearer's head (you can clearly see these changes in wedding photos of Nathalie of Sayn-Wittgenstein-Berleburg, the only bride to have worn it so far after it was altered). It will be extremely interesting to see what happens to the Khedive tiara in the next generation. Will Anne-Marie leave it to one of her daughters, who are no longer princesses of a reigning monarchy? 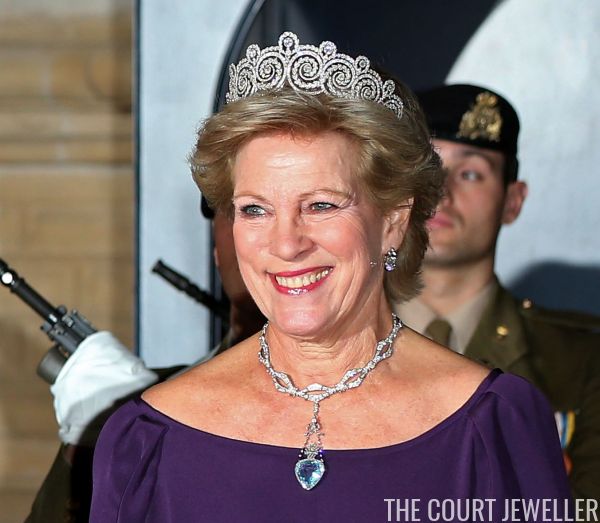 Will it be returned to the Danes, to preserve it officially as a wedding tiara for the next generation of royal brides? (That will include three Danish princesses -- Isabella, Josephine, and Athena -- as well as the granddaughters of Benedikte and Anne-Marie.) 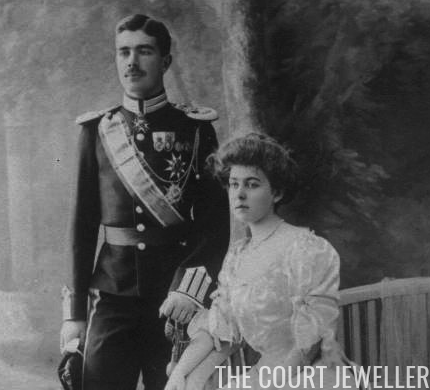 Cases like the Khedive, which has both historical and familial importance, make me wish that Ingrid had followed the example of Juliana of the Netherlands and set up a foundation for her jewelry. But for now, only time will tell.